Pumpkin Spice Pancakes are back at Denny's and the diner chain is offering them as an upgrade option for the $5.99 Super Slam deal. For an extra 49 cents, you can substitute Pumpkin Spice Pancakes in place of buttermilk ones. 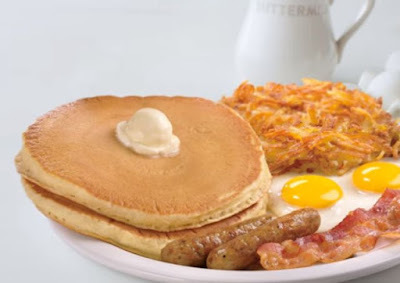 The $5.99 Super Slam deal ($6.99 in some areas) is available for a limited time at participating locations and includes two pancakes, two strips of bacon, two sausage links, two eggs, and hash browns.